Casa Grande Students Attend Celebrating Unity Event | The Pinnacle P.O.V. 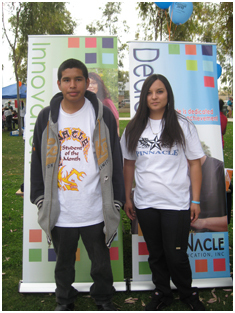 This month, several Pinnacle Charter High School students attended the Celebrating Unity event in Casa Grande, AZ. As a participating organization in the One More Step Coalition, Pinnacle’s Casa Grande campus attended the event to help honor the memory of Dr. Martin Luther King, Jr. The main focus of the coalition is to provide junior high and high school students with an alternative to gang affiliation, trying to help give teens a bright future. Just like Dr. King Jr. The coalition sponsored the Celebrating Unity event in Casa Grande to honor Dr. King, Jr. and all he accomplished for the civil rights movement. Since Pinnacle celebrates our diverse student population, students and teachers from our Casa Grande campus set up a booth and informed the community about Pinnacle and the opportunities we provide to all learners. ~ by pinnaclepov2224 on January 26, 2010.